A Treat in the Heat: Spectacular Summer Gift Baskets! After months that felt like years of seeing snowstorms on the nightly weather forecast, most of us are finally getting used to the idea that we won’t have to trudge outside an hour before work to shovel out our cars. At least not for a few months, anyway! I have finally tucked away my sweaters, the shovel and rock salt are in the garage, and I’ve been wearing maxi dresses that feel less like clothes and more like a flag of freedom. I can feel the breeze on my skin, and instead of instantly drying out my skin upon contact, it’s refreshing! As someone who has always been an autumn person, I’m embracing this weather with an appreciation I didn’t even know I had in me. I was cold for so, so, so long, and it feels so, so, so amazing to be warm! With this new weather comes a new lineup of foods as well. My cravings for heavy chowders and casseroles have been packed away with my winter clothes as I enjoy salads, smoothies, fresh fruit and other light fare. But my taste for more substantial eats hasn’t waned completely; I’m just leaning more toward typical summer goodness like ice cream and burgers. If someone you know is celebrating a summer birthday, or you’ve been invited for a cookout and want to bring along something extra special, consider a summer gift basket that was designed with the season in mind. 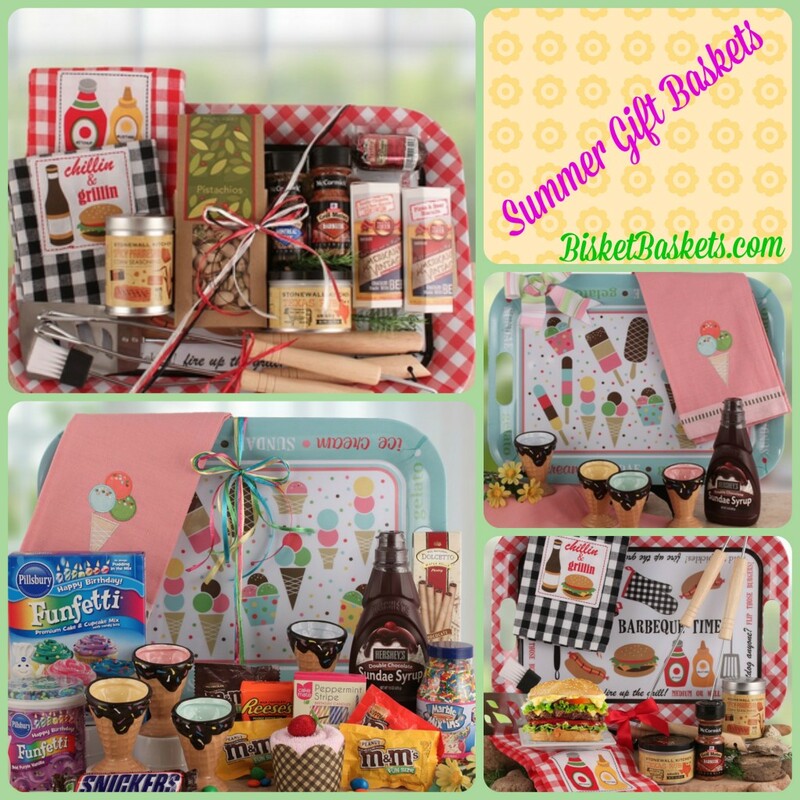 BisketBaskets.com has created some fantastic summer gift baskets, with our ice cream gift baskets and BBQ gift baskets being especially popular choices. With the change in seasons your clothes change, your mood changes, your activities change, and so forth. So why not mix up your gifts a little as well and embrace summer for all she has to offer! While I don’t dislike winter as much as many people, I do have to admit that I’d rather have a cheeseburger and sundae on the deck than be huddled up in a blanket sipping soup. Which reminds me – I can put away my throw blankets, too!